Thank you to Gelarti for providing complimentary product samples for us to base this review upon and for providing additional products for our contest prize. All opinions expressed are my own. For many families, back-to-school is an exciting time for buying new clothes, gear, and supplies for school. 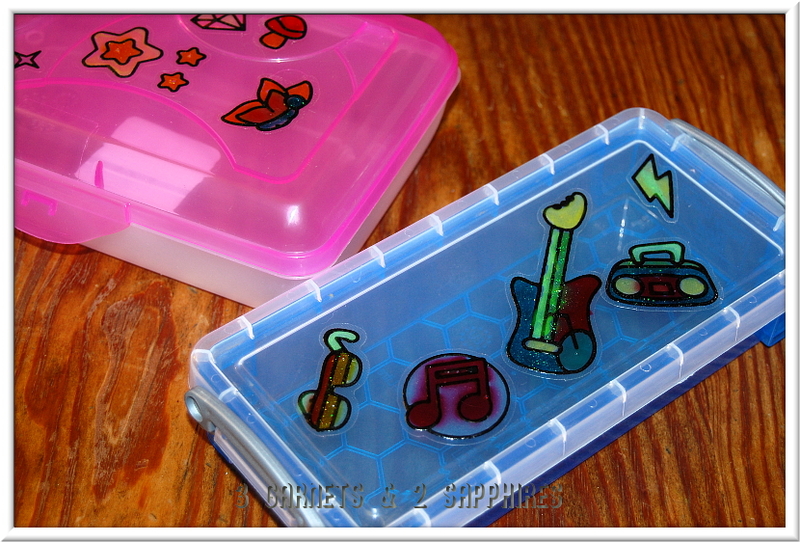 To add to that excitement, children can personalize their school supplies with Gelarti stickers. 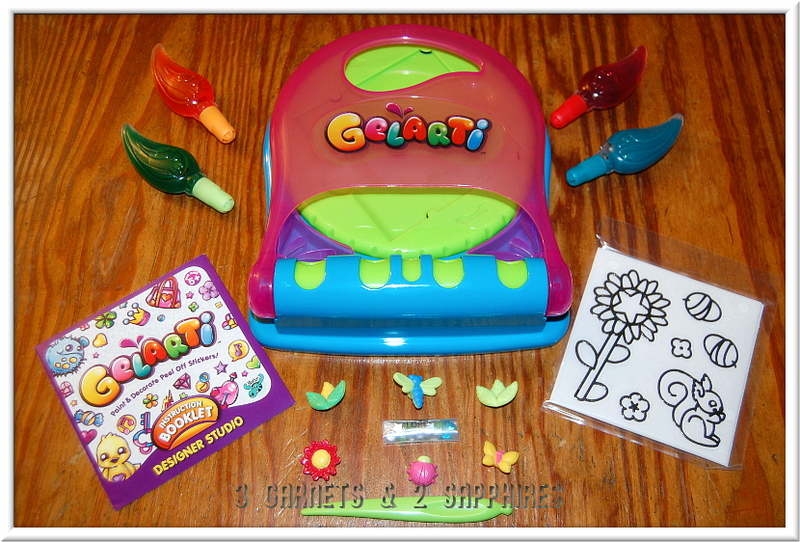 No two Gelarti stickers are exactly alike because children paint and decorate the stickers themselves. 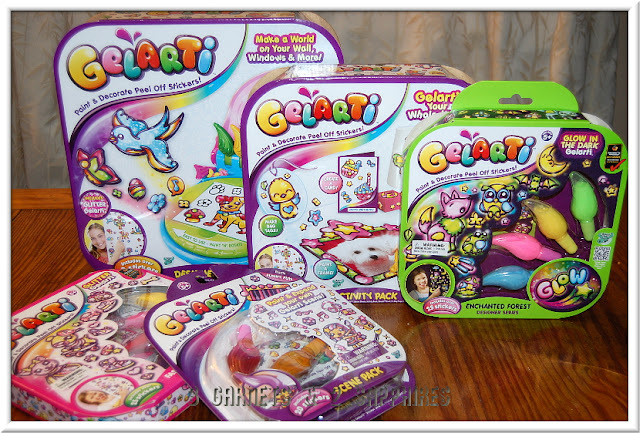 We received the Gelarti Designer Studio, the Gelarti Activity Pack, the Gelarti Enchanted Forest Glow-in-the-Dark Designer Series, the Gelarti Fashion Puppies Glitter Designer Series, and the Gelarti Rock/Funky Fun Scene Pack to try our hand at decorating our children's pencil boxes for school . . . 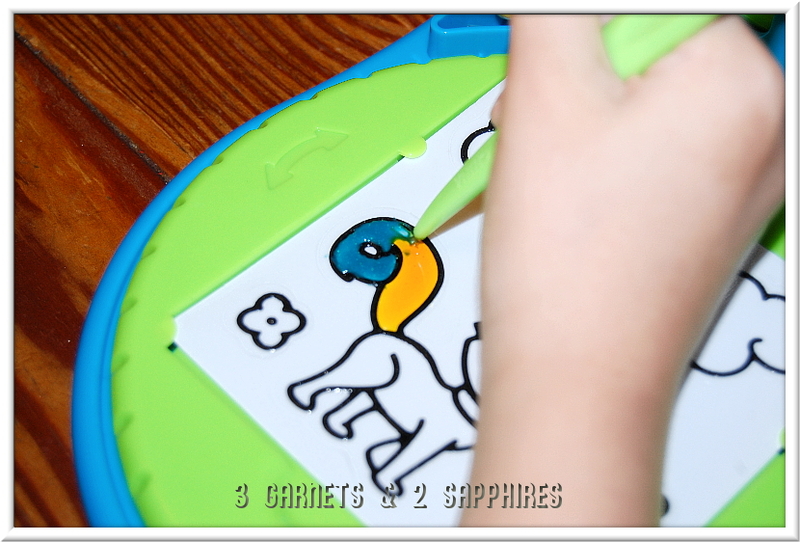 The Designer Studio comes with everything you need to get started, including the Designer Studio, 6 sheets of stickers, 4 paint pens, 12 gems and 6 embellishments, and 1 marbling tool. 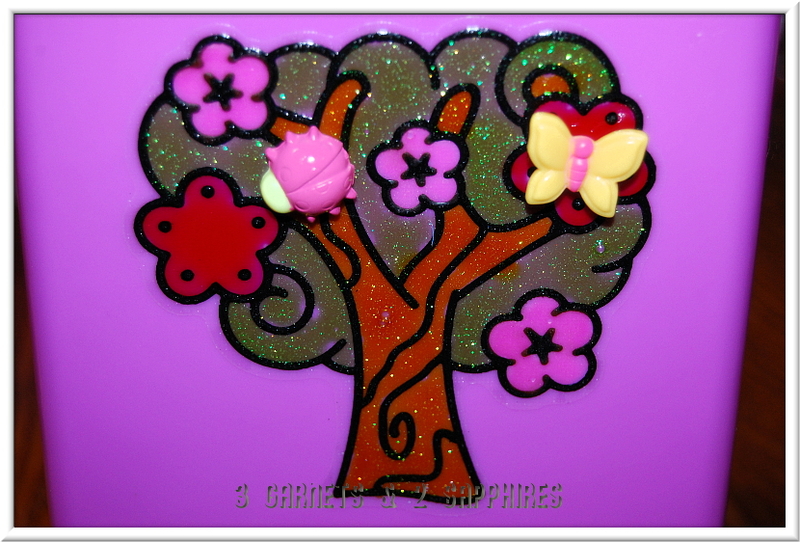 The Designer Studio itself is a handy thing to have because it holds and rotates your sticker sheet and stores your embellisments, but it is not a necessity. You can buy any of the Gelarti sets and use only the paint pens and stickers to start creating. The marbling tool does come in handy for more than just marbling though and it seems to only come with the Designer Studio and the Activity Packs. 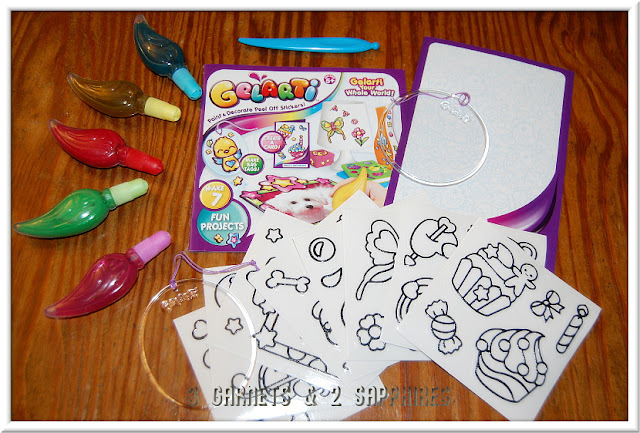 The Activity Pack is a fun set to own because it comes with themed stickers for a variety of seasons and holidays in addition to 2 sun catcher ornaments, 5 paint pens, a greeting card to decorate, and a marbling tool. Gelarti products are recommended for users age 5 and up. 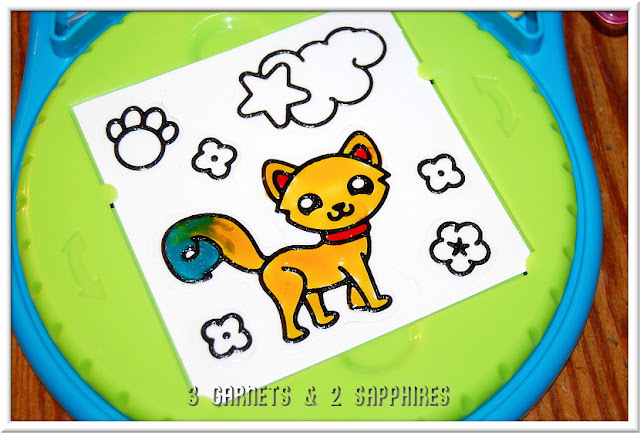 Our daughter is 6 and quite artistic, so I was not surprised that she found the Gelarti sets so easy to use. 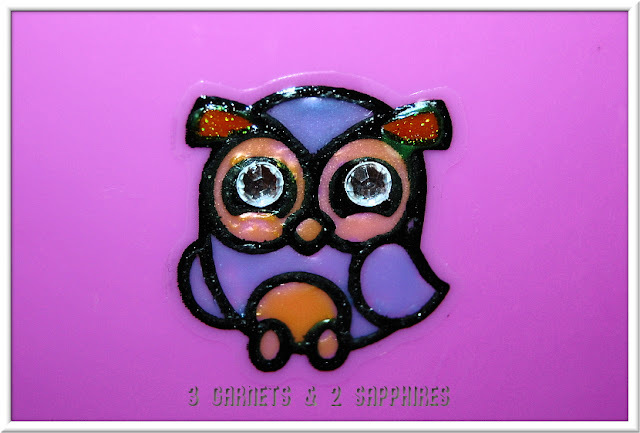 There is a very small learning curve because the different types of paint (original, glow-in-the-dark, glitter, etc . . . ) each have a different consistency. Some you will need to squeeze the bottle hard to get the paint out and some will just drip out on their own. On the same note, some paints will generally stay were you put it, while others will spread out without your help. I highly suggest you place a folded piece of paper towel next to your work space so that you can test out each paint for color and consistency. 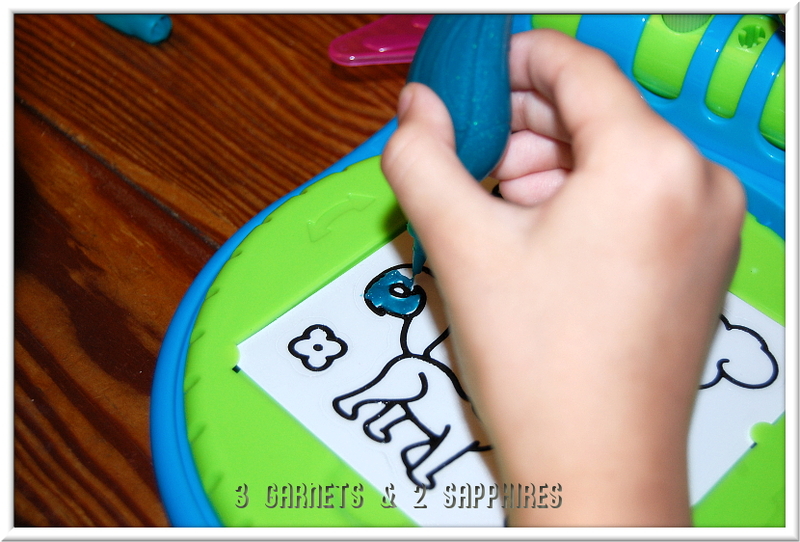 It's also helpful to squeeze out any air bubbles that may be in each paint pen before applying paint to your sticker. 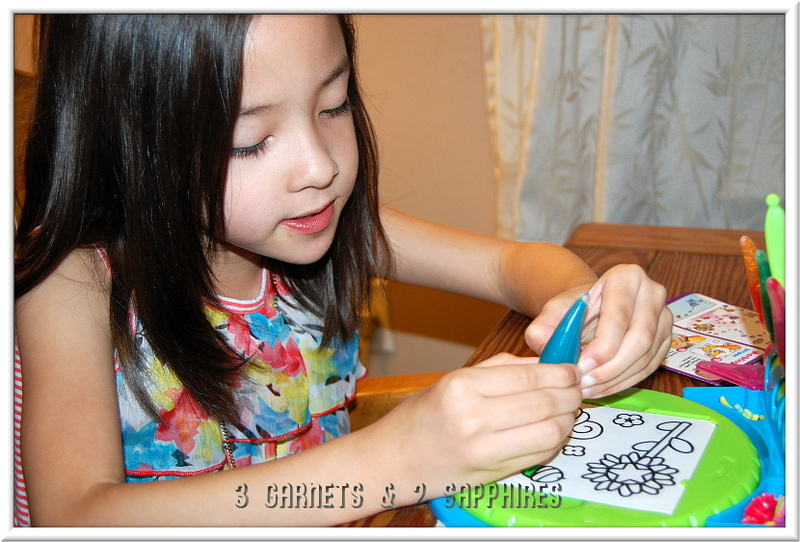 Using Gelarti is as easy as 1, 2, 3 . . .
1. 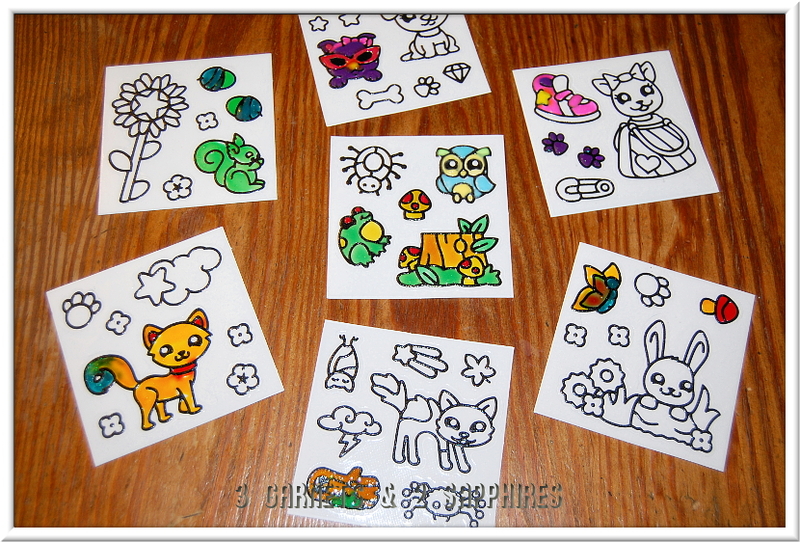 Fill the white spaces within the black outlines on your sticker with the paints of your choice. 2. Use the marbling tool to drag or swirl your paint, if desired. 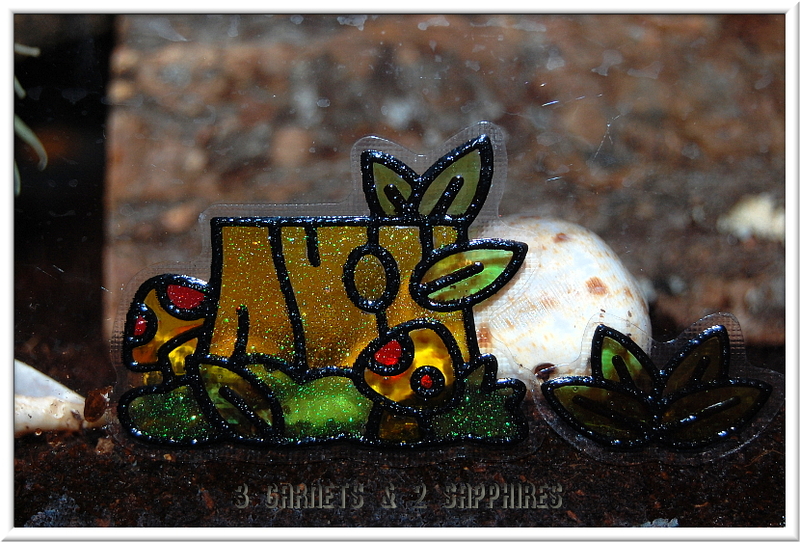 You can also add gemstones or embellishments if you like. 3. Here comes the hard part . . . let your freshly painted sticker dry for at least 6 hours. Our 6 year old daughter's first creation using Gelarti. I must say that Gelarti is a little addictive. 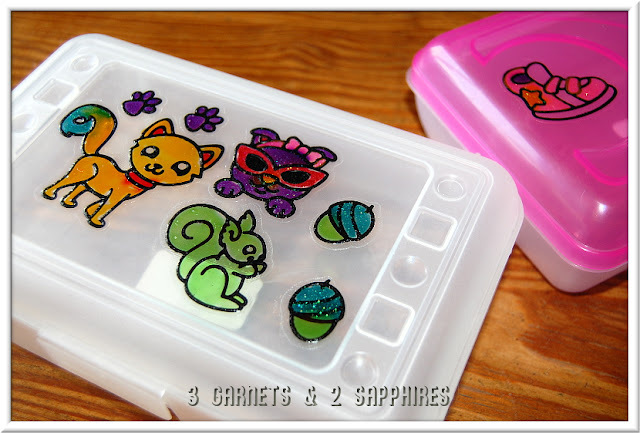 When you think you're done decorating your project with Gelarti stickers, you will likely decide that you could probably fit one or two more. Our 6 year daughter can pretty much use Gelarti independently. Once in awhile, she will ask me to use a wet paper towel to wipe off some paint that has landed or spread onto a spot where it was not meant to be. I have also helped her by using the marbling tool to push paint back into place or to remove paint that has accidentally covered the black outlines. Although most of the Gelarti stickers seem to be geared towards girls, our two sons both found some stickers they wanted to paint. In fact, our 9 year old son decided to decorate his pencil box too. Here are a few of the other things we decorated . . .
Tree stumps, logs, mushrooms, green plants, a frog, a spider, bats, a moon, and stars on the outside of our hermit crab habitat. 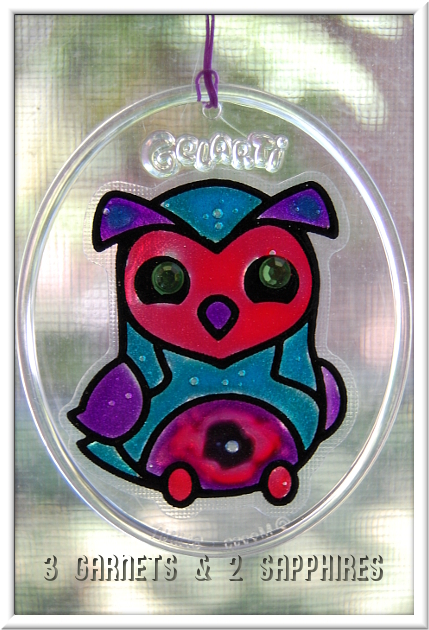 A sun catcher using an owl sticker with gemstone eyes. We marbleized the owl's belly, but while the paint dried, the colors seemed to pull back together. Also, a large bubble formed during the drying process. Our 6 year old daughter painted this tree and added two 3-dimensional embellishments. 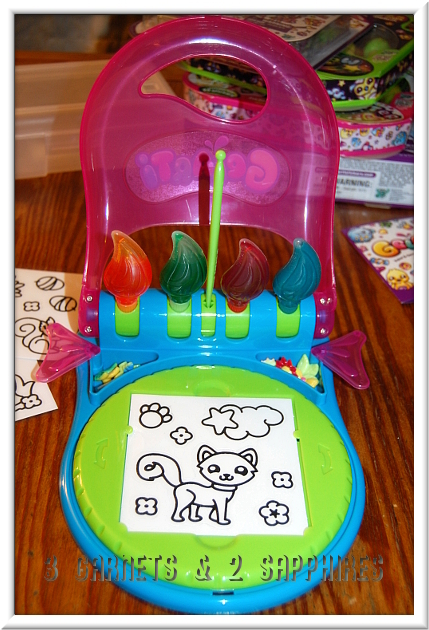 She used this to decorate her toy safe. This owl is also on our daughter's toy safe. She inadvertently let two colors run together, but then decided that she liked the way it looked. Gelarti stickers can stick to almost any clean flat smooth surface. They are also removeable and reusable. To learn more about Gelarti and to find some useful tips and tricks, visit GelartiStickers.com. The prize pack for this contest includes the following items . . .